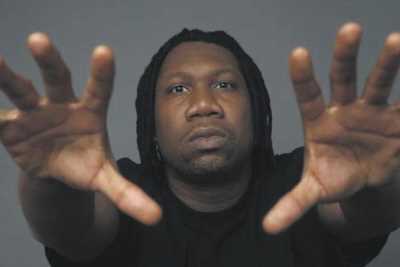 Krs-One. Photo courtesy of the artist. I once saw KRS-One at Bricks, long ago. I think he was touring for Kristyles, marking the first time I ever saw the Blast Master perform live. And it was absolutely amazing. Early in the show, he brought out a bin full of tennis balls he had autographed and began to toss them into the crowd. I wrapped my hand around one at the same time my buddy did. He wanted it more, I guess, and ended up with it. I was disappointed, but as the show went on, I noticed a lone tennis ball onstage, lodged beneath a speaker. I decided it was the only way I was going to get one, so I jumped on the stage, narrowly avoiding a bouncer. I grabbed the ball and held it up as I turned and faced the crowd. It was then that KRS noticed me and began to approach me, deviating from the song and freestyling at me, about me. I showed him the ball, the reason I disrupted his show. He grinned, gave me a pound, embraced me as I told him he was my hero and proceeded to rock the mic. I jumped offstage, on top of the world, carrying what would soon be a high expectation for hip-hop shows for years. Every time I saw an act, I measured it against KRS-One at Bricks. Almost nothing has stacked up over the years, not even subsequent KRS visits. I thought it would be much the same this time around. The show at Metro started with a slate of local openers, starting with Eneeone, which was fitting. The dude released an album a few years back with a track called “Radio,” featuring KRS-One himself. His set was brief, but a good precursor for the artists to follow. IVIE played second, beginning with some slower, jazz-infused songs that got him warmed up. He continued to escalate the level of excitement from track to track until his finale, a song about putting in the work for the dreams we all have. His give and take with the crowd was superb, leaving everyone less willing to leave their perches for more drinks in anticipation of the headliner. Michigan’s Ocelot was the last primer before KRS took the stage and he did very well, pushing the pace and the intensity. The crowd was whipped up, packed in and truly prepared for what KRS-One always brings to the stage. He generally comes out late at night, after a long wait, but it is always worth it. Before I go into the meat of the night, let me first digress and talk about the venue and those enjoying it. Metro is becoming one of my favorite spots to check out live music. The size is perfect for most of the music I follow, it’s easy to get to, and there is ample parking within walking distance, even when the Complex is bangin’. The atmosphere at Metro is also fitting for the music on the bill. It doesn’t feel corporate, but it doesn’t smell like piss either. For me, it is a combination I’ve come to enjoy. Metro has also racked up a good list of solid performers over the past several months. I like what they have going on. The people at the show were an eclectic mix, which wasn’t a surprise, knowing that KRS has been releasing music for over 30 years. There were a lot of greybeards present, a lot, but there were just as many youngsters rocking thrift store clothes that were actually in style when KRS was still dropping albums as BDP. The place was standing room only, a can of sardines, something only acceptable in such a scenario. KRS-One took the stage, beginning with classics. The crowd rapped along, finishing bars and choruses each time he pointed the mic away from himself. He played parts of too many songs to list, but highlights represented monumental albums like Criminal Minded, Return of the Boom Bap, I Got Next and his self-titled album from the middle of his golden years. We heard “The MC,” “Outta Here” and “MC’s Act Like They Don’t Know.” After his initial volley, KRS admitted that Salt Lake’s hip-hop scene knew what time it was, giving props for knowing all of the stuff he threw down. He then tried to get us by spitting out sound bites from a grip of other influential artists, again pointing the mic toward the crowd so we could finish the rhyme. It sounded like someone trying to find a radio station back in the day when there was only a dial, no digital settings. It was just quick blurbs from old songs. He thought he had us, but a few heads couldn’t be sidestepped by lesser-known standards. From there, and multiple times throughout the rest of the evening, KRS would freestyle, which would eventually lead into the distribution of life lessons, which were well-received, poignant and honest. He isn’t referred to as “The Teacha” for nothing. His soapbox sessions and cyphers included topics such as forgiveness, delivered beautifully, and the media’s influence on everything people do and consume. I’d never really watched KRS do this in the past—maybe a little, but not nearly as much as he did at Metro. Just another sign of the times, I suppose. He played a couple of new songs from his recently released The World is Mind, including the new and updated version of “Out for Fame.” He even gave us a listen to something new he’s toying with releasing, a song about the need for change in our education system that he was worried would create controversy, but I feel he hit the nail on the head. A fan offered KRS a painting. KRS brought the guy onstage and addressed him humbly, thanking him for pouring his heart into something to present the legendary orator with. I was reminded of just how real KRS is, and always has been. I love going to a show where I’m so close I can reach up and touch an artist, but I love it more when they reach back. KRS found a marker and started signing things as he rapped. People were lifting their phones and their shirts, and I lifted the notes I wrote for this review. He signed until fans had no more for him and he loved it. I loved it. I can’t even read most of what I scribbled down because it’s all covered in marker. I don’t need the notes anyway—I won’t forget much.